We love helping to teach children about their oral health and the importance of healthy teeth and gums. Starting your child’s dental care early has many advantages. We welcome children from their very first dental appointment to help familiarise them with the dental clinic atmosphere and determine if their development is occurring normally. We enthusiastically welcome your children to our dental clinic, where we hope to help them develop positive oral habits that last a lifetime. We serve families in Pascoe Vale, Glenroy, and the surrounding areas. What comprises preventive paediatric dentistry? How can I prepare my child for that first visit to the dentist? How can I clean my baby’s teeth? What kind of ongoing dental care does my child need? How can I promote good oral home care for my children? What should I do if my child is anxious about going to the dentist? What other conditions do you evaluate in children? Most experts agree that children should start seeing the dentist regularly as soon as their first tooth erupts, which is usually around the age of one. If you are uncertain what might be the best time for your children to come to our Pascoe Vale dental clinic, we invite you to ask Dr Amir Kiaee for his advice. Our experienced team knows how to provide children’s dentistry in Pascoe Vale that will encourage your little ones to develop a positive attitude about dental care. Your child’s first few visits to the dentist provide us with a great opportunity to educate you and your children about good oral health, and it enables kids to get used to the sights and sounds of the dental surgery. Tell them about what they can expect at the dentist but avoid any scary-sounding details such as references to needles or shots. If you have anxiety about visiting the dentist, do your best to refrain from speaking of it in front of your children. Check online or at your local library for videos and books about dentistry. Try to make the experience fun and interesting for your little ones by letting them pretend to examine your teeth. It’s crucial to start cleaning your baby’s teeth as soon as they erupt, and the best way to do it is with a clean washcloth or gauze pad to gently wipe the teeth clean. Do this after meals and before bedtime. Each child has individual needs, and we will base their dentistry on what they need most to maintain a healthy smile. We believe in interactive education because it involves your child in their own oral health and satisfies their natural curiosity and desire to participate. If they require dental treatment such as fillings, crowns or extractions, we do so with their comfort in mind. 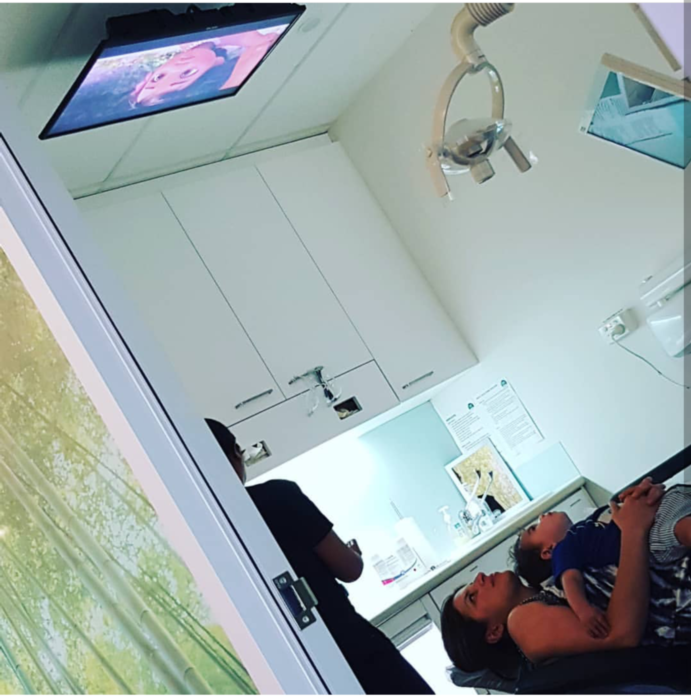 We even have televisions mounted on the ceilings in each of our rooms at our Pascoe Vale dental clinic so they can enjoy a favourite show as a distraction during treatment. Good oral health habits start early—and they usually begin at home. As parents, you can encourage the formation of positive habits that can last a lifetime. Brush and floss with your children. Kids like to mimic parents, and this is a great way to teach proper brushing and flossing technique. Get a special toothbrush with your child’s favourite cartoon character and a flavoured child-friendly toothpaste to make brushing fun. Use a timer to ensure you and your child are brushing long enough. The recommended time for brushing is two minutes. Create a special chart and give your child a gold star or sticker each time they brush and floss. Associate visits to the dentist with something fun by planning an outing to the park or a special bike ride after the appointment. Keep sweet treats to a minimum by keeping plenty of healthy snacks, such as fruits and vegetables, on hand. It’s perfectly normal to have fears, and fear of the dentist is a common one we see at our Pascoe Vale dental clinic—among kids and adults. But it’s important to help children overcome this fear, or it can be detrimental to their oral health. There are things you can do to help routine dental visits go more smoothly. Let your children know ahead of time they have a dental appointment. It might feel tempting not to alert them beforehand, but kids need time to transition into unfamiliar situations. Not telling them about the appointment until you are driving into the car park can worse their anxiety. Answer questions they might have about their dental appointment honestly and calmly. Be sure to remind them that they can also ask the dentist questions as well. Our Pascoe Vale dental team is trained to describe procedures to children in an age-appropriate, non-threatening manner. Bring along a small, favourite toy for your child. This can be a comfort when they are in an unfamiliar situation. Do your best to stay calm, even if your child ends up having a tantrum at their dental appointment. A soothing demeanour can go a long way toward helping your child feel safe. If you have additional concerns about your child’s dental anxiety, be sure to call our Pascoe Vale dental clinic ahead of time. Our entire team will work hard to ensure your child has as pleasant an experience as possible. While it is common for teens to wear braces, opting for an early childhood orthodontic evaluation can allow us to identify developmental conditions that may benefit from interceptive orthodontics such as space maintainers and early childhood braces. We typically recommend an orthodontic evaluation by age seven when we can begin the first phase of orthodontic treatment. This may minimise the need for lengthy orthodontic treatment in the future and eliminate the need for extractions due to malocclusion (poor bite alignment) in the future. We provide early childhood orthodontic evaluations as part of our comprehensive approach to paediatric dentistry in Pascoe Vale. We evaluate each child for sleep disorders including sleep apnoea, bruxism and snoring as part of the comprehensive care we provide. By identifying sleep disorders, in collaboration sleep specialists in the medical field, we help our youngest patients have a great start for a healthy future. While occasional snoring in children is normal, such as during a cold or after an especially active day, chronic snoring four or more nights a week can indicate a serious condition called obstructive sleep apnoea. Sleep apnoea can affect both children and adults alike, but it is often overlooked in children. Fortunately, treating sleep apnoea using the proper recommendations can restore normal brain function and minimise or eliminate symptoms associated with OSA. For more information regarding current studies follow this link. We are always taking new patients, including adults and children. As with adults, our approach with children is to create a positive dental experience that supports a healthy smile. Our entire team looks forward to welcoming you and your family to Lumino Smiles located in Pascoe Vale. Contact our Pascoe Vale dental clinic to arrange your child's next check-up appointment. Clean your child’s mouth every day, even if he or she doesn’t have teeth yet. You can take a soft cloth and clean along their gums to get them used to the process. After teeth grow in, use a small child’s brush with soft bristles to gently brush teeth twice each day. When your children are old enough, help them brush their teeth. Because youngsters lack the dexterity to brush their own teeth properly until they are about eight years old, you’ll need to supervise the process to ensure it is done right. Use toothpaste with fluoride. There are many flavours of toothpaste available in shops that your child will enjoy. Just a tiny amount of toothpaste on the brush is adequate. Set a good example. Brush your teeth alongside your child. When mums and dads are good role models for oral health care, kids are more apt to pick up good habits. Bring your child in for a check-up at our Pascoe Vale, VIC dental clinic where we are happy to provide children’s dentistry services. We believe that taking a proactive approach to your child's dental health is important. If you're wondering about your child's dental care, or when to bring them in, please don't hesitate to contact us at Lumino Smiles Dental. We look forward to seeing your entire family. We love welcoming children to our dental clinic. Our entire staff is dedicated to making our youngest patients feel comfortable and welcome. Early childhood dental appointments allow Dr Amir and our hygienist to ensure that your child is developing normally and help prevent common childhood dental conditions, such as decay. Is your clinic a family practice? We take great pride in being a family friendly practice. We gladly accommodate each and every member of the family. We even encourage parents to bring along their little ones to their dental appointments so the children can get used to the practice and create the habit of going to the dentist regularly. We recommend that your child have their first dental visit about six months after their first tooth appears. This is a great time for parents to discuss important topics such as home care, habits such as thumb sucking and nutritional support for healthy teeth. Can We Minimise the Need for Braces for My Child? Dr Amir takes a proactive approach to orthodontics and will evaluate your child around age six or seven to determine if early orthodontic treatment will benefit their development. These early orthodontic treatments often reduce their time in braces in the future and prevent the need for orthodontic-related tooth extractions. Is It Normal for Children to Snore? Regular snoring is not normal for children and may indicate a medical condition called obstructive sleep apnoea. A sleep evaluation can reveal the underlying cause of snoring and may prevent neurological and developmental problems. Should I Be Worried if My Child Grinds Their Teeth? Anytime a child or adult grinds their teeth regularly, it is best to seek advice from a qualified practitioner as it can indicate an underlying medical or dental condition that requires treatment. Call our office if you have questions.